An autopsy on the body of Arafat Jaradat finds that it is impossible to determine the cause of his death. PA blames Israel. An autopsy conducted on Sunday on the body of Arafat Jaradat, the terrorist prisoner who died at the Meggido Prison in northern Israel on Saturday, found that it is impossible to determine the exact cause of his death. The Palestinian Authority nevertheless took advantage of the non-conclusive report to blame Israel for allegedly torturing Jaradat to death. The autopsy, which was performed by the Institute of Forensic Medicine at Abu Kabir, found that no external signs of trauma were found on Jaradat’s body, and that no evidence of any disease was discovered. The Ministry of Health stated that it is impossible, therefore, to link the findings with a cause of death. He said the autopsy, which was carried out in the presence of a PA Arab doctor, indicated bruises on Jaradat's torso and damage to muscles, as well as "broken" ribs. Israel stressed that there were only "fractures in the ribs" which "could be testimony to resuscitation efforts." PA Arabs in Judea and Samaria took advantage of Jaradat’s death on Sunday, using it as their latest excuse for rioting. No one was reported hurt. The security forces are bracing for more violence, as preparations are being made for Jaradat’s funeral. 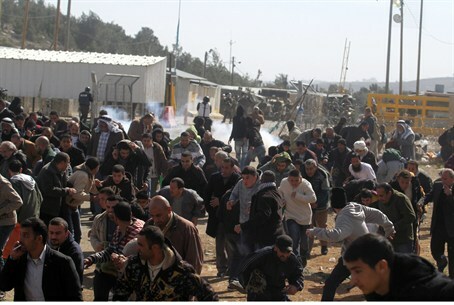 As the rioting continued on Sunday, Prime Minister Binyamin Netanyahu sent a message to the PA to calm tensions in Judea and Samaria. He also instructed Israeli authorities to transfer the PA its tax revenues for January, "so that they won't have an excuse not to enforce calm on the ground."